I was the Director General, Indian Coast Guard (DGICG) from Jan '15 till Feb '16. During that period, there were a couple of occasions where I had the opportunity to interact with the Raksha Mantri (RM), late Mr Manohar Parrikar. He was a simple man, very grounded, accessible and decisive. Whilst attending his meetings or interacting with him, I found him to be technically sound and always switched on, despite the fact that MOD was a new field for him. Whilst I used to meet him regularly, it was in Jun-Jul 2015, when I had the occasion to brief him frequently, since a Dornier aircraft of the ICG had crashed off the Tamilnadu coast on 8th of June 15, killing all three aircrew. As soon as the news was received, the search for the missing aircraft started immediately with the help of ships and aircraft, both from the Navy and the Coast Guard. As it usually happens with these kind of search efforts, there was no joy for almost a month. Quite naturally, the relatives of these officers were getting restless and they used to approach the RM to vent their anguish at the ICG but Mr Manohar Parrikar never put any pressure on the Coast Guard. He only told me to leave no stone unturned in the search efforts. After almost a month of search efforts being undertaken, with the approval of MOD, we made use of a specialised vessel with Reliance Industries, called 'MV Olympic Canyon' which was being used for drilling efforts in the KG Basin. This vessel had the capability to use its Remotely Operated Vehicle (ROV), to undertake seabed search in depths of about 3000 mts. This however would have cost the ICG huge amount of hiring charges, but the Reliance Industries were very gracious and waived off the rental charges for employment of this vessel, which alone amounted to approximately Rs 1 crore a day. After almost a month of the search effort getting underway, INS Sindhudhwaj, an EKM submarine of the Navy undertook underwater search of the area, taking into account the depth contours of the area navigating between underwater cliffs and received a barrage of strong transmissions from the Sonar Locator Beacon (SLB) of the crashed aircraft. The vessel Olympic Canyon was directed to proceed to that location and it lowered its Remotely Operated Vehicle (ROV), which was able to retrieve the entire debris of the aircraft including the mortal remains of the aircrew on the 39th day of the crash. Incidentally Mr Manohar Parrikar had discussed the technical details of the functioning of the SLB with me about a week before. He greatly appreciated the co-ordinated effort of all concerned in recovery of the crashed aircraft. Based on consultations with him, I also personally thanked Chairman of Reliance Industries for the kind gesture of sparing the vessel for us. Mr Manohar Parrikar was also a very humane person. I had invited him for my daughter's wedding on 26 Nov 15 and despite his busy schedule, he attended the wedding. 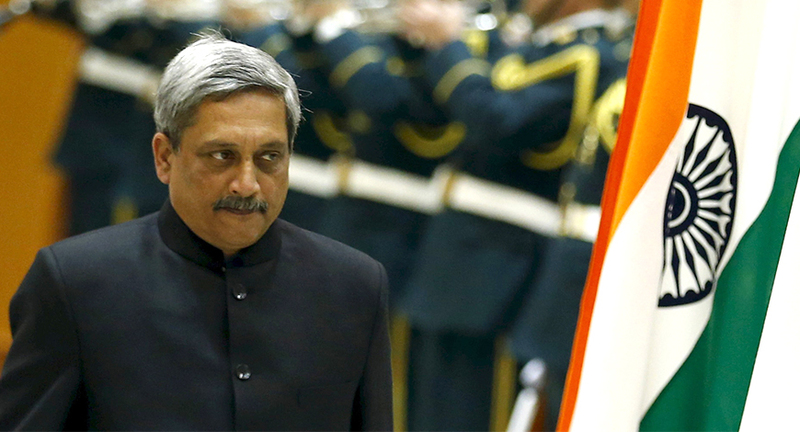 We will all miss you Mr Manohar Parrikar.